Taco Catering North Platte: The Taco Bar Gives You Options! The Taco Bar Gives You Options! When you are looking for great tasting, interesting catering options for your party or corporate catering event, turn to Qdoba for the Mexican food you know you love! What? You didn’t know that we did catering? We do! And we do it well! We have great options for you when you are picking what to order, too! It doesn’t need to be Tuesday for you to dive into a Taco Bar! 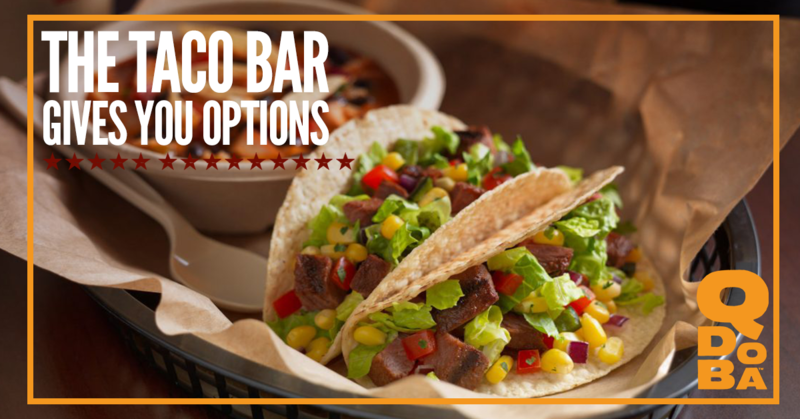 Our Taco Bar gives you the choice between marinated grilled chicken and marinated grilled steak to give your taco the flavorful protein you want. You can choose between a flour tortilla for a soft taco and the traditional hard corn tortilla. There are three salsas to choose from! Yes, you might have to have three tacos to try them all out! We offer Salsa Rojo, Salsa Verde, and Pico de Gallo to give your tacos a kick. Other traditional taco toppings are also provided: grated cheese, sour cream, fresh, hand-smashed guacamole, and crisp Romaine lettuce. We also offer handmade tortilla chips in case you need a cleanup crew for your plate after you eat your tacos. The Qdoba Taco Bar always included the option of a chocolate chip cookie or a double chocolate brownie for your dessert. To wash down your delicious taco, we offer a lemonade or iced tea. When you are looking for catering options, Qdoba’s got you covered! Choose the Tacos! Our options don’t stop with the food; you can choose to call today to set up your taco catering or you can contact us here, online and we’ll contact you! We serve Laramie, Cheyenne, and North Platte.